Notes: None, really! Please enjoy! If you were not credited for something you did, then please tell me! Credits are copied directly from the game. This looks unique and filled with flavor. Interested in the mechanics behind the "changers" and I sure love interactions. 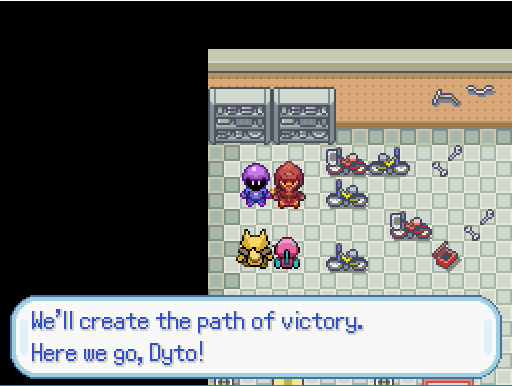 -If you lose against anyone other than porygon, the game goes back to the main menu. I feel like I am missing a Pokemon center or something, or is this just supposed to be a challenge? Thank you! I will fix the first two, but the third one is intentional. It's to make it more challenging!------------------------v1.1 is out. Same link as before, just redownload. It fixes the problems from before and a few others. Do you resume from your last save point following a game over? Or do you start the whole game over again? 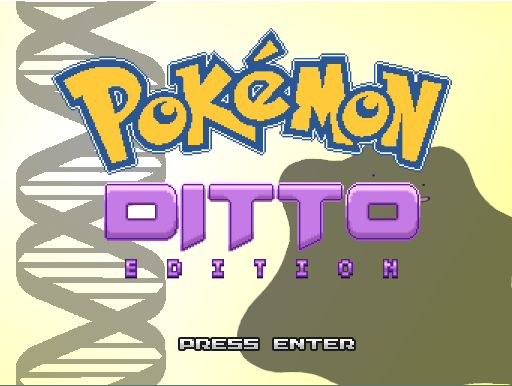 BTW, I do like the idea of playing as a Ditto. 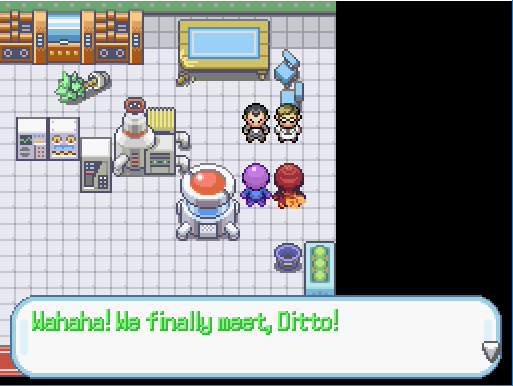 Being able to transform into over 40 different Pokemon makes this game a unique take on the "play-as-a-Pokemon" genre that's starting to pop up on Relic Castle. I hope to see more games like this in the future. Yeah, it's from the last time you saved. I cant figure out how to get back from the nightshade hangout. I'm stuck up there and there doesn't seem to be a way to get down. You can just exit the hideout through the red carpet, take the cave entrance on the raised ground, and then just go back to the start of the cave in reverse, can't you? If I go back into the cave on the raised ground it's a dead end. There is no way back because it's blocked by the cliffs you jump down. Oh no! That's an oversight, sorry, here's a fix. Oh, sweet. 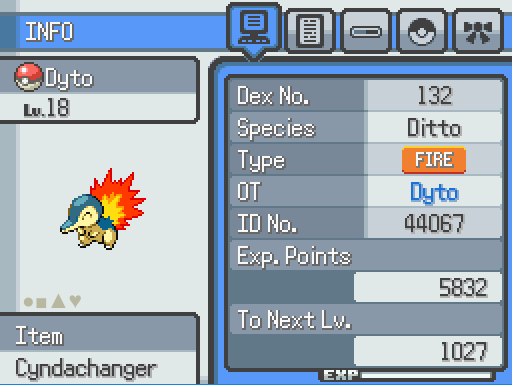 It's can continue recording my LP now lol. Great game so far btw. I'll fix it soon. Thank you for the report! how do i download this onto my comupter i got it in a winrar .zip file but idk how to get the game help!! i need help playing this game XD idk how to play / download it O_O plz help! I enjoy the challenge and concept of this game, except for the sudden difficulty spikes. 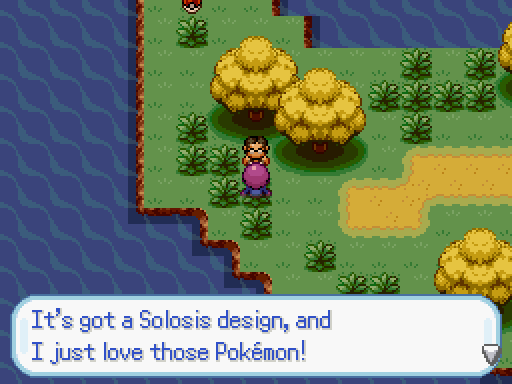 And on Kawashima and Pebble Islands, I haven't encountered any wild-Pokemon battles. 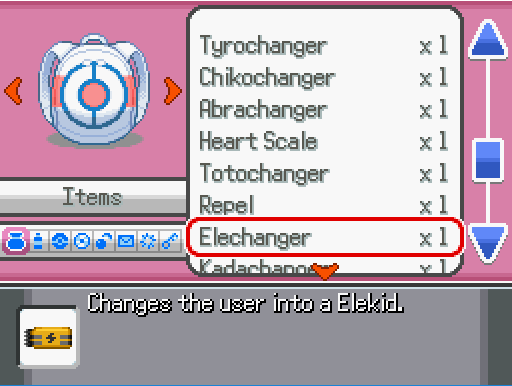 These are important for grinding levels, as otherwise, you get underleveled having to face nothing but trainers (whose levels grow a tad more quickly than yours do, eventually outstripping even your evolved Metachangers). this is such a cool idea! Just downloaded it, can't wait to start playing it!